Facing Adolescence Together - Family Times is an award-winning magazine with staff-written news, feature stories and artwork that inform and inspire Central New York parents and their children. Parenting teenagers is challenging. Adolescence can strain parents’ relationship with their teen and their relationship with each other. Dealing with teens, particularly difficult teens, can take a toll on a marriage. 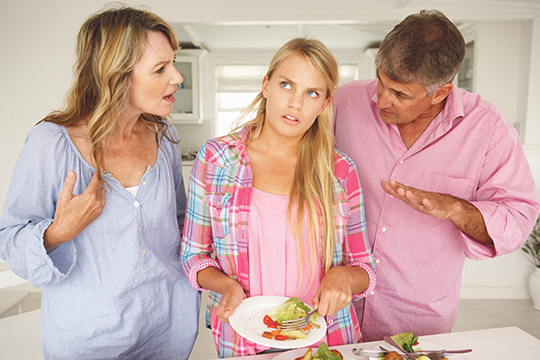 Parents disagree and begin to argue over how to handle their teenager. They start to blame each other for the teen’s behavior, and before you know it they’re acting distant and angry. Let’s not forget, there’s still the teenager to cope with. Nurturing a marriage is always important. During challenging times it is doubly important. What to do? Connect. It’s essential to spend time together as a couple. In hectic family schedules, it’s difficult to find time for just the two of you. Make it a priority by putting regular “dates” on the calendar, maybe the first and third Friday of each month. Take turns planning what you will do. That way no one partner is always in charge of setting things up. Sometimes it’s nice to just be ready at the appointed time. During your scheduled couple time, agree to not discuss problems. The object of this time is to reconnect as a couple and enjoy each other’s company. If there are issues needing discussion, find a time the next day to sort them out. Make sure you both follow through on your agreements, for your time together and the scheduled discussion. Communicate. It’s vital for parents to talk with each other about their teenage child. Get past your worries and discuss your goals. What are you trying to accomplish? Parents often agree on overall goals but don’t establish a path to get there. For example, if you agree your teen needs to take more responsibility for his actions, discuss exactly what that will look like. What are you taking on that really belongs to the teen? Agree on a plan to change your own behavior and inform your teenager. What will you, as parents, no longer take responsibility for? Reminding the teen when it’s time to leave for practice? If he misses practice, he will have to deal with the coach on his own. Take her dirty clothes to the laundry area? Running out of clean clothes might be inconvenient. Once the parental plan is agreed on, parents can offer support and encouragement to each other. Primary rules (for instance, issues of safety) need to be established by parents; however, most of the parenting work with teenagers is establishing a compromise with the teen that includes rules and consequences. Before starting to negotiate with your adolescent, confer with your partner on how each of you feels about issues you anticipate being discussed. If you are having trouble agreeing, decide to try one parent’s idea first. Give it an honest try and agree to come back together for more discussion after a few weeks. If it’s working, great. If not, try something else. It’s not a contest between parents on who has the best ideas. It’s about trying to raise a happy, healthy, responsible young adult. Parenting teenagers is more complicated than younger children. The issues and decisions are more complicated; give yourself some time to talk and review your options. Ask for help. The changing dynamics of a family with teenagers can be difficult. The stress is amplified when the adolescent is particularly difficult or if a parent is not the biological parent of the teen. Look for help from your emotional support system. Knowing others have been where you are or they’re thinking of you can give you what it takes to get through a difficult time. If you feel overwhelmed, consider seeking a family therapist to assist. A professional therapist can offer support, ideas and strategies to each family member. Raising teenagers can be tricky business. Making sure your marriage stays strong takes some extra attention. Cary and Tonja Rector are married and live with their children in Manlius. Cary is a licensed mental health counselor and Tonja is a licensed marriage and family therapist. Consult your own health care provider before making decisions affecting your family’s well-being. To comment on this article, write to editorial@familytimes.biz.